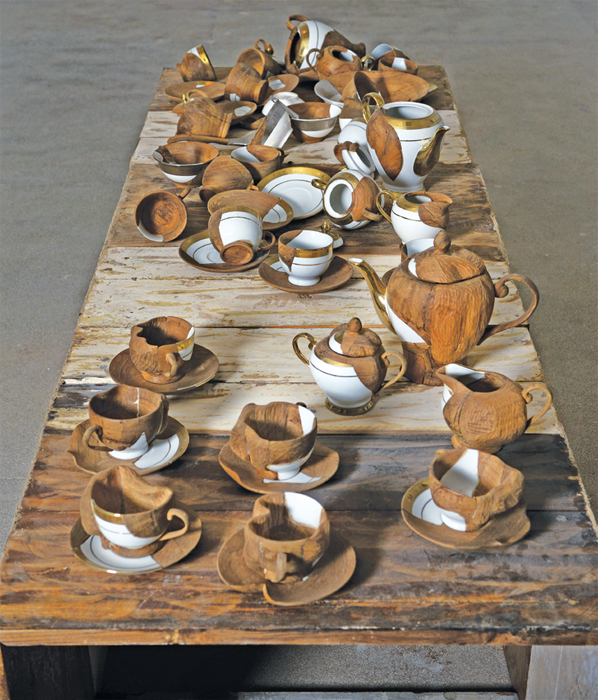 Sudarshan Shetty, untitled, 2013, ceramic, wood, 72 x 24 x 22". Without providing an explicit cause, Sudarshan Shetty created a dramatic landscape of mourning in his exhibition “every broken moment, piece by piece.” Objects such as a container full of smashed teacups, an urn dangling off a barren branch, or even a crumpled coat left hanging on the wall helped evoke the scene of a tragic aftermath. Even as Shetty advanced his preoccupation with mortality, he also considered transience and regeneration, staging acts and rituals of remembrance. Approaching his familiar subjects through small, quiet gestures instead of the monumental scale on which he has often previously worked, Shetty also seemed to seek a chance for rejuvenation in his own practice.